I thought Tonganoxie was an interesting word, since I had never heard of it before. I just thought it was a neat name for a quilt block. Upon further research, I found it is a city in Kansas, which was incorporated in 1870. The story goes that the city was named for a local Delaware Indian chief whose name meant "shorty" in the Delaware language. 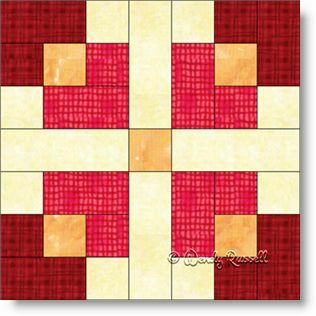 This seven patch quilt block is an easy one to construct as it is comprised of only squares and rectangles. However, don't let that fool you into thinking it will only make a boring quilt. By looking at the sample quilts illustrated, you can see there are all sorts of possibilities for laying out a number of blocks. Your imagination is all that is limiting you!